Following my "Holy bananas I'm not ready for this" revelation last week, I decided to use this weekend to take some real steps toward prepping for next year. Because heck, like it or not, Homeschool Year 5 is coming. It is coming at our faceholes and there is we can do to stop it. We decided on our start date, which is officially Somewhere Between Mid and Late August Or Maybe September But Probably Before September. Then, to celebrate this grand feat of decision making, I took the kids to Walmart. Just like everyone else with their Back-2-School lists and their Beat-Down-by-Summer faces, we trudge to Walmart every year about this time. The kids pick out a few pencils, folders and notebooks, and one outfit. We let the kids pick out one new set of clothes every year, without much more direction than "this year you need to find shoes with laces because you DEFINITELY need to get around to learning how to tie shoes". But besides the shoe thing, for this one day a year, their style is up to them. I'll be honest, it's had some interesting results. Last year, the girl children talked me into adding an "accessory" option to the outfit. M chose a watch. C chose a purse. The boys jumped in and got Star Wars hats. That is your background information. The boys wanted to accessorize too. And they did. By picking out new underwear. Personally, I've never considered underwear an accessory, but it's possible that explains the bleak state of my lingerie drawer. But my sons, oh they are innovators. They had dreams. Dreams of confidence boosting, cool-making underwear with radical themes like Justice League! and Captain Underpants! Now when H chose the Captain Underpants underpants I thought, well, guess you couldn't find a more appropriate pair of underpants if you tried. Plus? The top pair in the pack were plain white briefs. And everyone knows you can't go wrong with a classic. So why not? You do you, little dudes. Accessorize those butts. We get home and the girls need to try out their outfits and H needs to try out his underwear. Which is how he very promptly discovered that his new accessory underwear is not normal underwear at all. In fact. His accessory underwear came with its own accessory. That's right. *** His underwear has its own cape. 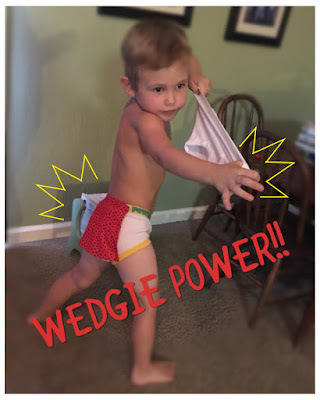 Now not only is this the world's least practical pair of underwear AND the world's least appropriate place for a cape, but he then spent the rest of the evening running around the house screaming "WEDGIE POWEEEEERRRR!" while flinging his underwear at his siblings. So... I dunno. Can we call phys ed? Turns out I may not but done with the crying out for Serenity thing. Because there's some stuff about life that's just not going to change any time soon. But heck, maybe that's okay. *They chose "soon!". Also, "let's start when everyone else starts!". And... well mom disagrees. **So... at what age does it stop being a cute kid thing, and do you need to worry that your child is actually turning into a creepy cat lady? Also do they have therapies for things like this? Or maybe a pill? Because if we're really seeing the signs well... I mean I'd like to catch it early.